Certain species of fish help clean up a pond by eating algae, collections of green organisms that look like plants but don't have the roots, stems or leaves of true plants. Algae live and grow in stagnant water and can quickly take over an entire pond if left to their own devices. Add the right combination of pond cleaning fish to keep algae to a minimum. Fish that clean ponds by eating algae and other debris include the common pleco, the mosquitofish, the Siamese algae eater and the grass carp. Be careful with carp, koi and other bottom feeders. While they eat algae, they can also make your pond look dirty. Also known as the suckermouth catfish, the common pleco (Hypostomus plecostomus) is omnivorous, feeding on algae, plant material and insects in a pond. It can grow to more than 24 inches long and is known for being aggressive in adulthood, so stick to one pleco in your pond at a time. Mosquitofish (Gambusia affinis) are small freshwater fish that eat mosquito larvae. Mosquitoes breed in many backyard water bodies including ponds. 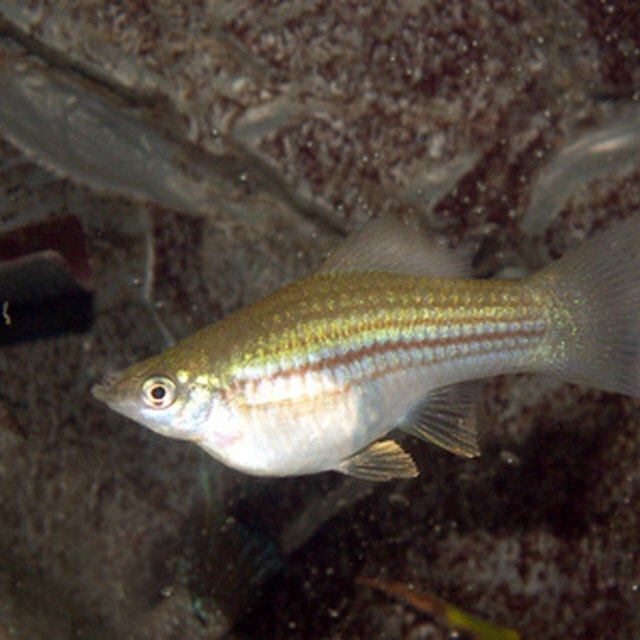 Mosquitofish are compatible with most ornamental pond fish, but they live most harmoniously with fish their own size, as larger fish sometimes eat mosquitofish. If mosquitofish live with larger fish, provide them with plenty of hiding places such as rocks and vegetation. The Siamese Algae Eater (Gyrinocheilus aymonieri) is a large pond fish native to Asia. It grows up to 11 inches long and uses its suckerlike mouth to remove algae attached to rocks, plants and sides of the pond. The Siamese Algae Eater can be territorial, so test it with different pond fish to check for compatibility. Grass carp (Ctenopharyngodon idella) are voracious feeders that can eat 40 to 300 percent of their body weight each day in plant material. They eat algae but can be selective eaters and prefer rooted vegetation such as grass on the side of the pond. However, grass carp are good choices for long-term control of rooted vegetation. While it's true that bottom feeders like carp (Cyprinus carpio), koi and goldfish feed on algae and insects in a pond, their constant rooting around at the bottom of the pond can create water clarity issues, particularly if the pond has a clay or silt bottom. While these fish species may well eat lots of your pond's algae, they may also make it look dirtier. Gillespie, Claire. "What Fish Will Help Clean Up a Pond?" Sciencing, https://sciencing.com/fish-clean-up-pond-5815590.html. 13 April 2018.